Back in 2007 I began making our laundry soap using a recipe from the Simple Dollar. This liquid version has worked great for us for years, but since we have moved I no longer have a practical place to store the 5 gallon bucket. So, I began to experiment with homemade laundry soap powder. I have always used Fels Naptha in the liquid detergent, but I found that since it is such a hard soap, when I used it in the powder recipe, it didn't seem to dissolve all the way in the wash. There are oodles of laundry detergent recipes out there, but after much experimenting, this is what I have found works best for us. Also, the powder version is really easy for my kids to manage when they are doing their own laundry. 1. Mix borax and washing soda together. 2. Grate Zote bar with a cheese grater. Mix with borax and washing soda. 3. Process all ingredients in a food processor until mixture resembles a fine powder. 5. Use 1-2 tbsp. per load, depending on load size. 1) This will make approximately 80 tbsp. of powder. I use 1 tbsp. for a medium size load, and 2 for an extra large load. Or, if the extra large load isn't super dirty, I'll just use 1 tbsp. 2) The jar was a $0.25 yard sale find...wish I could help you out with where to find one! 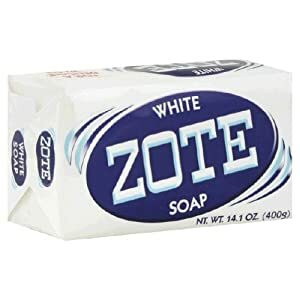 3) I've been doing some comparing, and I believe this soap is very similar to Charlie's Soap Powder, just obviously at a fraction of the cost. I had been using it to wash the cloth diapers but now am using my homemade detergent and it is working awesome! Have you ever tried making your laundry soap? If so, what's your favorite, liquid or powder? Great! I've been looking for an easy version! Thanks so much! Glad to hear somebody else uses a 5 gallon bucket for a step stool as well, lol! =) Are you making dish detergent for washing dishes or for the dishwasher? I would love to see your recipe! Haven't tried making our own detergent, and wonder why every time I spend so much for a new box or bottle. Ellie at Beauty4Ashes shared a recipe I've been meaning to try... I think maybe it's the one with Fels Naptha, so it's good to hear about issues and an alternative... or to have 2 to try. I would love to hear what you think if you try them both. A second opinion on what works best would be awesome! I use Fels Naptha in ours. I've never seen the one you have though. I'll have to keep my eye out!! Last time is was at Wal-Mart they didn't have any Borax!! I had to buy commercial detergent and am hoping to get another chance to look for the Borax later. I much prefer making our own soap. Ours is powder also. I love it!! I found the Zote right by the Fels Naptha at our Walmart. Maybe yours will start carrying it soon. I really love the Zote...was reading the manufacturers site and it was saying that they make it with citronella oil. Makes it smell so good! Yes, I use 1 for medium loads and 2 for large loads. But if it's a large load that is not that dirty, I just use one. I believe this will make around 80 loads if you just did 1 tbsp. per load. Love this! Great idea to use the food processor to make it more evening dispersed... I was just grating the bar of soap (I have tried both FelsNaptha and Zote and love the Zote more) before and it was separating from the rest of the powder! Thanks for the tip! will this work in a High efficiency machine? is it ok to use in HE washers? I love the idea of this recipe being a powder. Does it dissolve in cold water washes as well as warm or hot?